Being the capital of the homonymous province in the Netherlands, Utrecht entices all tourists with its famous channels and wharfs which, along with its Dome Tower, yield the symbol of the city. Culturally speaking, Utrecht is the second liveliest city in the Netherlands, next to Amsterdam, and its historic background makes Utrecht be highly thought of by any serious visitor who wants to make of their stay more than a pleasure trip. Having been the core of Christianity in the Netherlands ever since the 7th century, nowadays Utrecht is still a significant point of Catholic religion in the world. However, despite its rather stiff image rendered by the historic, the religious and the cultural background, Utrecht is overwhelmingly lively by its world renowned shopping opportunities and sparkling night life enabled by one of the largest indoor shopping centre in Europe (Hoog Catharijne) and the plethora of clubs, bars and pubs, respectively. Romans were the first historically significant people who inhabited the place of the nowadays Utrecht, as from around 50 BC, in view of establishing a fortification for Roman soldiers. However, their dominion over the place did not last more than 3 centuries, Utrecht being conquered alternately by Franks and Frisians. 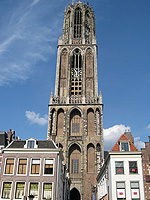 For about 9 centuries, Utrecht represented the core of Christianity in the Netherlands, and in the 16th century, the city standed out as the birth place of the Dutch Republic, by the Union of Utrecht, reinforced once again in 1713, by the Treaty of Utrecht, which definitely settled the disputes with Spain. It might be rightfully stated that Utrecht services extremely well its tourists with respect to accommodation. On the one hand, both business and leisure travelers are likely to find that hotels in Utrecht comply with their highest accommodation requirements; on the other hand, any category of tourists, regardless of budget limitations, will be able to say that hotels, hostels, or camping sites and bed & breakfasts do not fall short from the general statement that the city has the ability of dealing with the significant tourist flow. The gastronomic Utrecht is not so far from being rightfully equated with the Dutch cuisine in its entirety, since the city is somehow located in the central part of the Netherlands. By consequence, all that is characteristic of the overall Dutch cuisine is highly likely to be found in Utrecht, such as sundry types of cheese and chocolate. Regional cheeses refer to Gouda, Leidse, Edam, Leerdammer and Beemster. But soused herring should be just as well sampled, along with the types of mayonnaise and the mustard produced in the northern part of the region. The Dome Church and the Dome Tower (the latter being the best preserved part of the former) are the closest thing to the idea of symbol of the city. A special feature of the tower is that it is the tallest landmark of this kind in the entire country, and it also overlooks the whole skyline of Utrecht. There are four other religious settlements, namely, the St. Pieters Church, the St. Paulus Church, the St. Jans Church and the St. Maria Church. The many channels and wharfs the city is replete with are a tourist must-see, along with the more significant museums of Utrecht, that is, the Money Museum, the Aboriginal Art Museum or the Museum of Catholic Church. Hoog Catharijne is a rather modern objective which is worth taking into consideration, since it is one of the largest indoor shopping centers in Europe. From the point of view of cultural events, Utrecht is the second in the Netherlands, next to Amsterdam. Thus, the Early Music Festival, the Spring Dance Festival, the Netherlands Film Festival and the Holland Animation Film Festival, along with the Festival ad Werf are the first coming in mind. However, the eventful calendar of Utrecht is complemented by the Summer Darkness, the Festival of Old Music, the De Beschaving, the International Chamber Music Festival or the Elf Fantasy Fair. Coveted after for centuries by sundry dynasties and political forces, nowadays Luxembourg is a destination of great impact in terms of both business and leisure tourism. At the same time, Luxembourg is the paradigm of peaks of French and German cultures joining together into a perfect expression. Capital of the Lorraine region, Metz has always featured an air of otherworldliness as compared to other typical French cities. Metz is also the place where the philosopher Nietzsche served as German solder in the Franco-Prussian War. Interesting enough, some might say, for making a trip to Metz. What is striking about Strasbourg is this city, on the one hand, is exemplary for what cities of legal and cultural importance should be like. On the other hand, the rigidity that comes with such a feature is evened by the liveliness of the plethora of tourist opportunities, of which one should always focus on the gastronomic experiences Strasbourg makes available. Crossed by the Moselle River and by the Saar River, Trier is a place of prominent significance as destination in terms of cultural tourism. Yet, the lay-out and the resourcefulness of Trier make available countless tourist opportunities besides sightseeing, such as shopping and, why not, biking. Bettering Amsterdam, for instance, in terms of greenery, The Hague is, as it seems, more than the Legal Capital of the World. One should always take into account sunbathing when planning a stay in The Hague, since the city is not all about the gloominess that comes with its legal statute. Amsterdam is a city of great cultural importance for the Netherlands, and not only. Yet, Amsterdam is a sparkling city with more or less controversial leisure opportunities arising at each and every corner. In this respect, the capital of the Netherlands is renowned for the possibilities made available by the ill famed and yet inviting red light district and cannabis coffee shops.